282 x 199 mm. – 253 leaves. With 16 (6 full-page) woodcuts in contemporary colouring. Das Buch ... genannt der Seüsse, et al. First edition of Suso's "Exemplar". With: Rulman Merswin, Neunfelsenbuch, and Henricus de Herp, Spieghel van Volcomenheit (chapter 60, in German). Compilation edited by Felix Fabri. The Dominican Heinrich Seuse (Latin: Suso; c. 1295-1366) was one of the great figures in German mysticism. 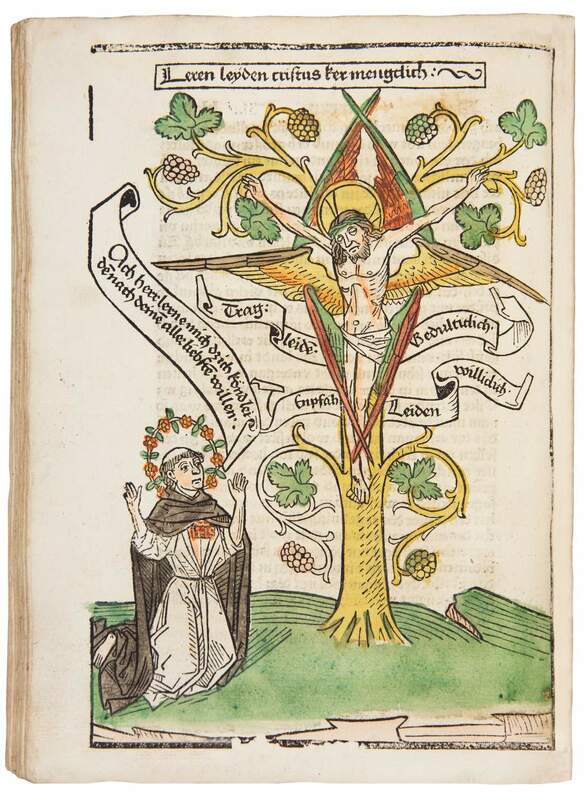 Around 1361-1363, he compiled and revised his four major German writings into one volume, the Exemplar of his spiritual legacy. The same texts are comprised in the present first printed edition: his autobiography, Das Büchlein der ewigen Weisheit, Das Büchlein der Wahrheit, and a selection of eleven letters. Two further works are included at the end that were sometimes attributed to Seuse. The remarkable illustration is almost restricted to the first book, Seuse's vita. The figure of Seuse is distinguished by a rose garland around his head, as a kind of halo. The specific iconography of the depictions is closely related to the text. It is thought that Seuse himself illustrated his original manuscript of the Exemplar, and that the following examples, including the present woodcuts, are identical in subject while of different artistic quality.